Before 1921 Catholics in the West Valley had to travel to San Fernando (St. Ferdinand’s Church) or to Ventura (San Buenaventura Mission) for Mass. 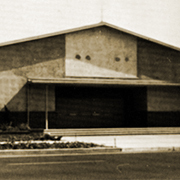 In 1921 Our Lady of the Valley parish was founded and remained the only Catholic church in the West Valley until 1949 when St. Catherine of Siena was established in Reseda. 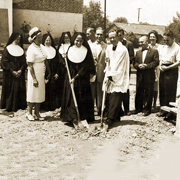 St. Joseph the Worker was founded in May 1956 to serve the growing west San Fernando Valley. Masses and celebrations took place in loaned and rented buildings in the area until December 1957 when Mass was celebrated in the building that is the present Msgr. Austin J. Greene Conference Center. The parish grew in numbers and ministry under the leadership of our first pastor, Fr. Austin J. Greene. 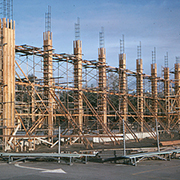 St. Joseph the Worker School was completed in two phases, in September 1957 and January 1960. The school was staffed by the Sisters of St. Joseph of Carondelet. A convent was completed in April 1964. Today this building serves as the Parish Center, where pastoral staff offices are located. On April 30, 1961, James Francis Cardinal McIntyre presided at a Solemn High Mass of dedication of the parish. He also dedicated the present church in August 1968. The St. Joseph chapter of the Society of St. Vincent de Paul was established in 1968. The Vincentians lead the parish social justice ministry to this day. The St. Vincent de Paul Food Pantry opens every Saturday morning to provide bags of groceries and supplies to the needy. In addition, a warm meal is prepared by volunteers three days a week and served to the homeless and hungry in our neighborhood. Msgr. Greene retired in September 1981 and was succeeded by Fr. James Loughnane. Fr. Loughnane undertook needed maintenance projects on the school, convent, rectory, and grounds. He fostered parishioner involvement through the Renew program and a youth program. Other new ministries included RCIA, Bible Study, Contemplative Prayer, weekly Adoration of the Blessed Sacrament, the Finance Committee, Liturgy Committee, Vocation Committee, Children’s Choir, and Youth Choir. 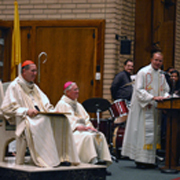 Spanish Mass was introduced in 1982, and a Hispanic ministry formed. In 1983 the Vietnamese Community was invited to celebrate liturgy every Sunday in their native language. In 1989 Fr. Loughnane launched a Capital Development Campaign to fund important modernization of the older buildings as well as new construction. A lunch pavilion adjacent to the school provided comfort and shelter for our students and served as a gathering area for parishioners. Construction was completed in June 1990. Subsequently, the choir loft was expanded and reinforced. 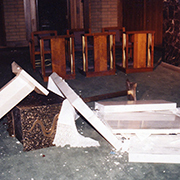 The altar railing was removed and was used to construct the baptismal font, the ambo, and the presider’s chair. The altar was relocated to its present position in closer proximity to the assembly. In the late 1980s a team of St. Joseph the Worker parishioners, along with volunteers from Our Lady of Grace, Encino, introduced a project now known as “Tuna Sunday.” These original volunteers called themselves the “freeway flyers.” Once a week they went downtown to the Catholic Worker hospitality center in Los Angeles skid row (6th Street and Gladys Street) to help prepare meals for the hungry. Their concern for “the least among us” led to what is now our monthly Tuna Sunday. Parishioners bring large cans of tuna on the first Sunday of the month. These are transported to the Catholic Worker where volunteers make tuna casserole for our brothers and sisters on skid row. Fr. James C. Gehl became the new pastor in May 1993, when Msgr. Loughnane was named pastor of St. Denis parish, Diamond Bar. Fr. Jim continued the work begun by Fr. Loughnane by completing the newly configured church and the installation of the new organ. The St. Joseph the Worker Gift Shop opened for business in 1993, proving so successful that one year later the seed money to establish the shop had been repaid. 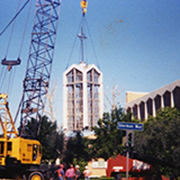 The Northridge Earthquake struck in 1994. Because of extensive damage to the church and bell tower, all liturgical activity was moved to the parish hall for several months. Parishioners responded generously and enough money was raised to complete all repairs by the following year. The Peace Garden and Gathering Area, completed in 2001 and dedicated to Msgr. Loughnane, provides a welcoming exterior to the church. 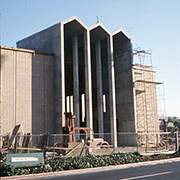 On April 27, 2002, the remodeled Msgr. Austin J. Greene Conference Center opened. Msgr. Gehl left St. Joseph the Worker in June 2004 to become pastor of St. Bede the Venerable parish in La Cañada-Flintridge. Msgr. Paul Albee was named Administrator Pro-Tem and served through June 2005. 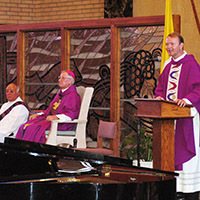 In July 2005 the parish welcomed its fourth pastor, Fr. Kevin Rettig. Soon after his arrival, Fr. Kevin introduced the celebration of the Feast of Corpus Christi (annually, in June), including a procession through the Winnetka neighborhood. St. Joseph the Worker invests a great deal of energy in creating liturgies that are inspiring, prayerful, and reverent. Our liturgies are a place of welcome and inclusion, where everyone belongs. Digital technology and innovations in liturgical software offer potential for enhancing the worship experience. In early 2010 projection screens were installed in the church, enabling the display of the Mass parts, multilingual song lyrics, and images. Church beautification was a priority during 2011. Over many months, the pews were refinished, new carpeting installed, and tile placed around the altar. The Music Ministry is a source of parish pride. 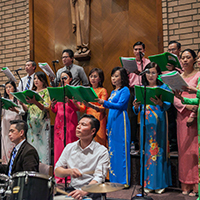 The members of eight different choirs, from traditional to contemporary, in English, Spanish, and Vietnamese, engage the assembly in prayerful song at seven weekend liturgies and other celebrations. In summer 2008, the 9:30 choir, accompanied by many parishioners, toured Eastern Europe, singing at liturgies in Budapest, Vienna, Prague, and Berlin. Choir members and many parishioners came together to present “Welcome Matt,” a musical based on the gospel of Matthew, in spring 2011. The Music Ministry took its show on the road again in 2012 when choir members embarked upon an East Coast Heritage Tour. They participated in liturgies and performed in concert in Washington, D.C. (National Shrine of the Immaculate Conception), New York (St. Patrick’s Cathedral), Philadelphia (St. Augustine Church), and Boston (Faneuil Hall). In summer 2014, choir members and musicians went on a ten-day choral pilgrimage featuring concert appearances at California missions from San Francisco to San Diego. To underscore the importance of continuing adult education, the parish has presented a series of symposia on a variety of topics. The first, in fall 2011, was a three-part program called “Living and Leaving on Your Own Terms.” The presentations addressed issues of life and death: making difficult medical decisions, writing a will, and planning a funeral. 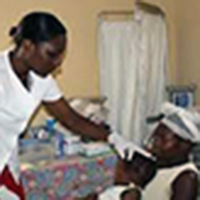 The program stressed the importance of advance planning – the gift of a lifetime to loved ones. The Second Vatican Council opened in Rome on October 11, 1962. To commemorate the fiftieth anniversary of this ground-breaking event in the life of the church, in fall 2012 St. Joseph the Worker presented its second academic-style symposium, “Vatican II and Why It Matters.” In four sessions, distinguished speakers lectured on the origins and vision of the Council, liturgical reform, the role of the church in the modern world, and ecumenism and interfaith dialogue. On May 1, 2016, the Feast of St. Joseph the Worker, Fr. 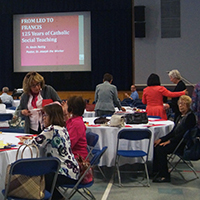 Kevin Rettig, Pastor, led a symposium titled “From Leo to Francis: 125 Years of Catholic Social Teaching. In his illustrated presentation, the third in our series of adult educational programs, Fr. Kevin traced the evolution of Catholic social teaching and how it has inspired meaningful social action throughout the world. The highlight of spring 2017 was the fourth in our series of educational symposia: “Renewal for All: An Ecumenical Commemoration of the 500th Anniversary of the Reformation.” Together with our Lutheran sisters and brothers from nearby churches and California Lutheran University, we commemorated the anniversary of the Reformation with a two-part event: a presentation featuring talks by a Catholic and a Lutheran on the roots and consequences of the Reformation and an ecumenical prayer service celebrating fifty years of Lutheran-Catholic dialogue, led by Fr. Kevin Rettig, Pastor, and Bishop R. Guy Erwin, Southwest California Synod, Evangelical Lutheran Church in America. St. Joseph the Worker celebrated its Golden Jubilee in 2006. Festivities began with the Anniversary Mass in January, Cardinal Roger Mahony, presiding. Commemorative activities continued throughout the year, including a gala celebration dinner in May. The parish also published a fiftieth anniversary commemorative pictorial album. The parish celebrated Fr. Kevin’s Silver Anniversary of ordination to the priesthood in June 2009 with an Anniversary Mass and reception. Along with Fr. Kevin’s family and friends, the parish joined in songs of joy and prayers of thanksgiving for the gift of Fr. Kevin and his priestly ministry. On June 8, 2013, parishioner Gus Mora was ordained to the diaconate at the Cathedral of Our Lady of the Angels. Gus and his wife, Onie, completed a five-year formation program. Deacon Gus assists the presider at Mass and sometimes preaches, performs the sacrament of baptism, presides at gravesite services and funerals, witnesses weddings, visits the sick, and conducts retreats and days of recollection. Onie supports Gus in his diaconal ministry and assists in the celebration of the sacraments. At a reception on June 30, 2013, parishioners said goodbye to associate pastors Fr. Ty Bui and Fr. Hugo Neyra, who moved on to new assignments in the archdiocese. In July the parish welcomed new associate pastors Fr Julio Ramos and Fr. Joseph Van Vu. After emigrating from Vietnam, Fr. Joseph entered St. John’s Seminary and was ordained in May 2009.Fr. Julio Ramos, from Guadalajara, Mexico was ordained a priest of the Guadalupe Missionaries order in July 2001. 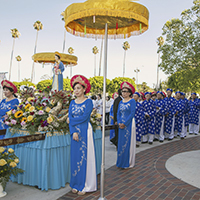 The celebrations resumed in August with the commemoration of the thirtieth anniversary of the Vietnamese community at St. Joseph the Worker. Our second pastor, Msgr. James Loughnane, welcomed Vietnamese Catholics into our parish family in 1983. Since then, we have been enriched by the traditions and beauty of the Vietnamese culture. The year 2013 concluded with the celebration of the twentieth anniversary of the SJW Gift Shop. From a modest beginning, in December 1993, during Fr. Jim Gehl’s first year as pastor, the Gift Shop has grown into a flourishing parish ministry. Staffed entirely by volunteers, the Gift Shop is an important source of parish revenue. 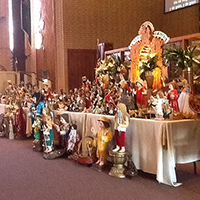 The last Saturday in January is the annual Infant Jesus of Prague nine-hour novena, organized by the Infant Jesus of Prague Apostolic Group of the San Fernando Valley. The 2014 event commemorated the novena’s thirtieth anniversary. The program includes prayer, presentations on the chosen theme, blessing of the children, blessing of the images, and celebration of the Holy Eucharist. It was time to say farewell once again, in June, when Fr. Julio Ramos left St. Joseph the Worker to become pastor of St. Martha’s parish in Huntington Park. It wasn’t long, however, before a new associate pastor, Fr. Roberto Rueda, arrived. Originally from Toledo, Spain, Fr. Roberto served previously at Resurrection Church and St. Michael Church. St. Joseph the Worker School opened the 2016-2017 academic year with a new principal, CJ Kruska, who succeeded Sr. Barbara Joseph Wilson, CSJ, principal since 2000. Mr. Kruska’s career in Catholic education began right here when he joined the SJW school faculty in 2000 He taught all levels, from kindergarten through eighth grade, until 2006 when he moved on to Bishop Alemany High School (Mission Hills). He also served as principal of St. Catherine of Siena School (Reseda). With profound sadness the parish bid farewell to Fr. Kevin Rettig at the end of June. After twelve years (2005-2017) as pastor at St. Joseph the Worker (the maximum allowed under the present system in the Los Angeles Archdiocese), Fr. Kevin was named pastor of Holy Angels parish, Arcadia, effective July 1. During his time here, Fr. Kevin’s words enriched our souls and nourished our spirit. In teaching us about love, he brought us closer to God and to one another. Our new pastor, Fr. Alberto (Beto) Villalobos, comes to St. Joseph the Worker following sixteen years at Nativity parish, El Monte. Fr. Beto has served in various parishes in the archdiocese and spent ten years in Catholic high school administration. At the end of June 2018, we said goodbye to Fr. Joseph Vu. During his five years as associate pastor, Fr. Joseph touched our lives in so many ways, particularly in the Vietnamese community. We thank him for sharing his gift of priesthood with us, and we wish him all God’s blessings in his new assignment at St. Lucy parish in Long Beach. In July Fr. Thuan Nguyen joined the pastoral staff as associate pastor. Fr. Thuan comes to us from Our Lady of the Assumption parish, Claremont. He joined the Vietnamese Dominican vocation center at the age of thirteen where he completed studies in philosophy and theology. 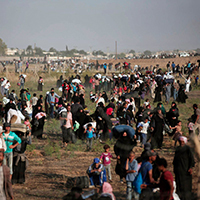 When the government did not allow his ordination, he escaped his homeland and lived in a refugee camp in Thailand for nearly two years. He eventually settled in Canada and was ordained there in 1993. Before coming to the Archdiocese of Los Angeles, he served as pastor of Vietnamese Martyrs parish in Phoenix, Arizona, for ten years, while also leading the Vietnamese community in the Phoenix diocese.